Let us find the definition of greatest common factor as we journey into Zapzapmath. A café that specialises in burgers has just popped out on the other side of town! Aptly named Burger Bar, this little café may be new, but it has garnered local fans from all over the ecosystem. The menu consists of many different burger variations, from a good ol’ Cheeseburger, to a Fish and Chips burger, to a Burger Within a Burger burger! Needless to say, this new kid on the block definitely stacks up above the rest! Business has been incredible since the successful opening and launch of the Burger Bar. In fact, business has grown so much over the past couple of days that the owner, Mr. Pickles, is on the lookout for a new team member to manage the counter orders. Since you love burgers as much as you adore numbers, you take Mr. Pickles up on the job. You put on your Burger Bar uniform, and immediately get to work! The doors open to a flood of hungry mathlings, cash in hand and ready to order their meals in a nicely coordinated line. When a customer places an order, the cash register totals up the order and previews the total on the screen. The customer hands you coins in various denominations as payment for their order. These coins are not your average coins – each coin shows a different multiplication, and your duty is to find which multiplication sums up to the total amount needed for that particular order. First, you need to identify the various multiplication calculations. Then you need to distinguish which of them will multiply to the exact total needed on both cash registers. Once you have chosen the groups of coins to go in each cash register, place them into the cash registers by dragging the coins to the individual slots. However, your job does not end there! The very last step to getting the order calculations right requires you to know the definition of greatest common factor. The best way to do this is to search through the two lists of multiplication sums, and point out which numbers they have in common. Sometimes there is just one number in common, other times there may be more than one. If there is more than one, pick the biggest number out of the lot - that is the greatest common factor - and key that in by tapping on the arrows to change the value on the answer box. Tap on the submit button to process that order. If your answer is correct, the order is processed without any problems. If your answer is wrong, the order will be a mess of wrong evaluations. Either way, mathlings are a patient bunch, so do take your time to double check and make sure you understand the definition of greatest common factor. 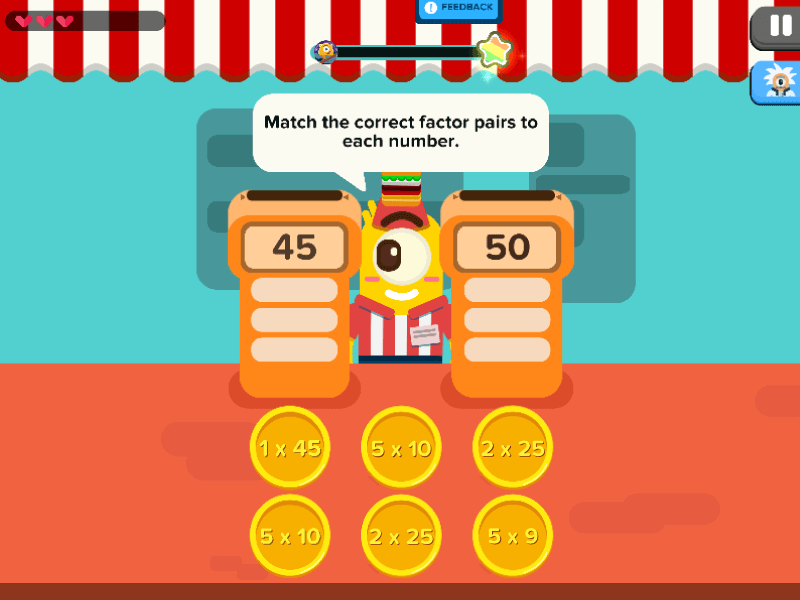 Burger Bar is a game that teaches you how to find the Greatest Common Factor between two numbers. When we find all the factors of two or more numbers, we will notice that some numbers are the same. These are called Common Factors. The definition of greatest common factor is the biggest factor which is shared by two or more numbers. This game allows you to identify patterns in numbers, and coordinate answers to them. Stack the factors to make them great!